“I’ve had enough of this!” You say to yourself. It’s been six months since your WordPress site went live and you still aren’t getting anything out of it. Not a single lead, not a single sale, not even a single comment from your audience. Things are looking THAT bad. At this point, you’re at your wits’ end. You’ve lost all hope and are thinking about shutting down your site. Don’t quit just yet, OK? If you’re in that kind of a situation right now (or something very close it), allow me to help you with turning things around. Because using landing pages are tried and tested strategies to convert web visitors into leads or into buying customers, I will share with you 4 landing page creation tips that you can use, that will skyrocket your WordPress site’s performance in terms of generating leads and sales. Everything starts with you investing on a robust landing page creation tool that you will integrate with your WordPress website. While there are several inexpensive tools that you can use online, don’t fall into the trap of choosing something just because they’re cheap. You’d be better off investing in a powerful tool that you know you can rely on, and can get the job done, even if it is slightly more pricey. After all, if you pay peanuts, you get monkeys. This saying has proven itself to be true for several business owners and marketers. This is especially the case when they opt for the cheapest online tools that they can get their hands. In a lot of cases, they either end up getting frustrated by their choice of tools’ lack of features, or they end up spending more down the line by the add-ons that they’d have to purchase so that they can accomplish their goals. I’m a huge fan of GetResponse’s responsive landing page templates. 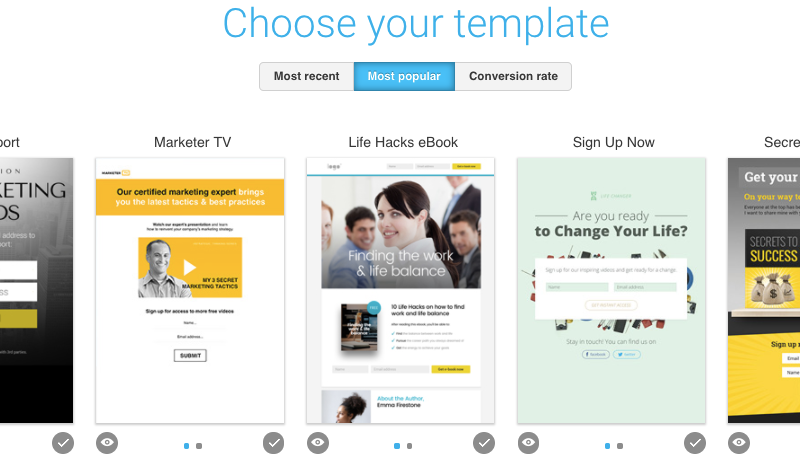 Not only do their templates look amazing, but they’re also packed with truckloads of features that can help the website owners generate more leads and sales. Another thing worth mentioning is how their platform is very user-friendly; so much so that even total newbies would be able to navigate and familiarize the platform’s key features after spending a few minutes on the site. When a webmaster is using a landing page creation tool like GetResponse, they’d be able to create stunning, yet high-converting landing pages in a matter of minutes. Whether the website owners are looking to generate leads, sales, or build relationship with their audience, a landing page creation tool like GetResponse would be able to help them with that. Now that you’re using a platform that you can rely on – one that’s powerful enough to support your business from its startup days up until it grows to epic levels – then you need to make sure that your landing pages have the crucial elements that can compel your web traffic to sign up to your forms. A summary of your offer that emphasizes how your audience can benefit from it. Supporting elements like videos, badges, guarantees, testimonials, etc. Your call-to-action buttons or forms. These are just some of the crucial elements that your landing page needs to have. While there several other elements that you can include, just using the ones that I shared above should be deadly enough to help you generate leads and sales through your WordPress website. That’s what your web traffic is thinking about – whether consciously or subconsciously — when they’re on your web pages. When you go to a networking event and meet with someone, you’re most likely asking the same question. When you log into your inbox to check if someone emailed you, you’re most likely thinking about the same thing too. When someone connects with you on Skype, the chances are good that you’re still thinking about the same thing. Such is how our minds are wired. While there are certainly exceptions to the rule, a good bit of people follow the same kind of thought pattern. Because most of us are looking for opportunities on how we can benefit from something, then wouldn’t it make sense for you to create your landing pages with this principle in mind? A lot of marketers and business owners focus too much on how amazing their products are, how long they have been in business, or how well connected they are, etc. Rambling about these things, again and again, will get you nowhere. Remember that your audience is only interested in how they can benefit from something. That said, when creating your WordPress website’s landing page, you ought to focus on how your audience can benefit from you, instead of only talking about who you are and what your product is. A powerful Conversion Rate Optimization (CRO) technique that copywriters use is to make their readers emotional. After all, when the readers are emotional, that’s when it’s the easiest to influence them to take action on the solution you’re offering to their problems. Scenario #1: You straight-up tell your audience to buy your WordPress website security plugin. Scenario #2: Before you tell them to buy your website security plugin, you’ll remind them first about how their website was hacked in the past; how much money they lost to retrieve their site, the number of sales that they missed, and how their reputation was damaged due to what the hacker did. I’m sure you’ll agree with me if I tell you that your chances of selling your website security plugin are a lot higher on scenario number 2. As you can probably see, the glaring difference between both scenarios is that on the second one, their audience has been made emotional since they are reminded of how painful the experience was for them when their website was hacked. So much so that they’d want to protect themselves from the same issue, even if they’d have to part with some of their money to buy your product. What are some of the crucial things that you consider when creating a landing page? Please share your landing page creation tips in the comments section below.